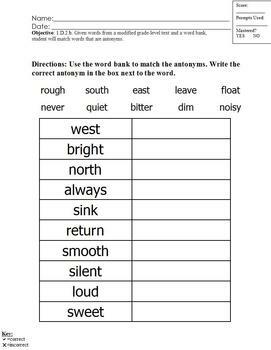 This worksheet has ten words, and students students have to find the opposite of each word. There is a word bank, so students are matching the antonyms and then writing the words. This is modified from the middle school reading curriculum. It is modified to about a third grade level. It would be good to use as homework, a warm-up, classwork, or an assessment. 1.D.2.b. Given words from a modified grade-level text and a word bank, student will match words that are antonyms.